For almost 20 years Jewels "RavynHawk" Kincaid has embraced the beauty and truth found in Native American spirituality, leading them to their first encounter digging their own crystals back in Sept. of 1992. Having had a truly, life-changing experience on her very first dig, with her beloved husband Dino, she decided to move to Mount Ida, AR "The Crystal Capital of the World" in the autumn of 1999, where they have built a wonderful shop, and continue to share their passion, knowledge and many talents with all those who visit. This workshop has been designed to be a hands-on, inter-active sharing of the knowledge of quartz crystals, coupled with the passion and joy that can be found in digging your own crystals in our 10 acre mine. First, we will gather at The Crystal Inn at 8:00 am for orientation, coffee and a wonderful hot breakfast, introducing ourselves and breaking bread together. After breakfast, we will all caravan to our mine (weather permitting) or to the shop, if not. There we will discuss the initial forming of these crystal deposits in Arkansas, which began some 250 million years ago during the time between the Permian and Pennsylvanian eras, leaving behind some of the richest veins of clear Quartz Crystal (SiO2) in the world. We will also discuss their piezo-electric (applied pressure) and triboluminescence (fractal light, due to friction in the darkness) properties, as well as their many different configurations which are much like our own personalities. Secondly, Crystals have been mined for years for their physical properties as well as commercial uses, especially their transmission capabilities, which were applied in the old crystal radios, when crystal first began to be commercially mined here in the 40's. 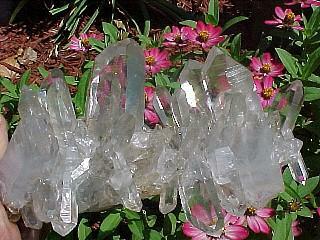 Next we will discuss some of the different crystal formations, as well some of their many metaphysical properties. You will receive a laminated crystal chart to help along the way as RavynHawk passes around an assortment of crystals to identify. They also have many other commercial uses, including watch faces and computer chips. Certain formations also make wonderful tools for meditation, Reiki practitioners and other types of energy work, some of which will be discussed and demonstrated in this workshop. At 11:00am we will be aligning our time to coincide with many others like us who are gathering all over the world on this occasion. We will gather in a circle and have a sage blessing and short meditation beginning at 11:00am until 11:11. Afterwards, we will discuss the Crystalline Vortex here in AR. 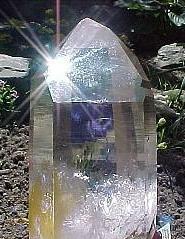 and the pre-designated "triple activation days" which have been occurring since January 1, 2001, along with the activation and continuous progression of the nine Master Crystals from Atlantis, which have been awakening since August 8, 2008 (8/8/8) when we first helped to awaken the Blue Crystal of Knowledge (beneath Talimena Ridge. AR) which was moved here for safe-keeping before the final cataclysm in Atlantis. On 9/9/9 and 10/10/10 we again took part in the awakening of the Emerald Crystal of Healing (housed beneath Mount Magazine, AR) and the Violet Crystal of Sound in Bahia, Brazil, respectively. That brings us now to 11/11/11 and the awakening and initial activation of both the sun disc (under Pinnacle Mountain, near Little Rock, AR) and the Platinum Crystal of Communication near Eureka Springs, AR. You will learn why Arkansas was chosen to host three of these master crystals and the parts they play in the ascension of Mother Earth and by extension, all mankind. The academic part of the workshop has concluded. Finally, we will embark on a guided tour of the mine, complete with tips for different ways of digging. Upon completing the tour, we will gather for a closing prayer, and you will all have the rest of the day to dig crystals, hike and commune with Mother Earth and each other. Then at 6:00 pm, we will welcome you all back to join us in our "open house at The Crystal Seen, for an evening of sharing with our crystal family, with refreshments, Q&A and mini crystal readings (of some of the crystals you dug in the mine) with RavynHawk, to celebrate the day. Attendance will be limited to 22 people per day over three days from Friday through Sunday and will fill quickly, so act now to reserve your place for this unique workshop and timely gathering. Below you will find three links to pay now buttons to reserve your space on the day that best suits your needs. The rates for each workshop will be $119.00 per person. You must register by Oct. 10th to insure your place in this unique event. Late reservations will be accepted, but are subject to higher rates. We look forward to sharing with all of you! Crystal Blessings upon us all! 3) For digging in the mine~ a shoulder bag, backpack and/or bucket to carry your crystals and tools, a flat-head screw-driver (to dislodge points) garden tools, gloves and maybe something to sit on and a light lunch or snacks. For those who would like to try their hand at hard-rock mining (working the veins for virgin crystals) we also recommend a camper shovel, rock hammers, pry bars, knee pads and leather gloves etc. At this time of year, there is little need for insect repellent or sun-block and the weather is usually in the 60's or 70's. We will watch the weather and keep you posted as we get closer. There are no facilities at the mine. This mine has not been commercially worked in over 10 years and is without any equipment, now re-claimed and back in its natural state. There are no deep pits, high walls or flagged areas, so you are free to dig and wander wherever you like. Listen to the wind as it whistles through the pines; walk and gather and discover how rainfall and natural erosion continuously wash up new crystals. Wonderful specimens have been found digging mere inches from the surface. Having a great love for the "true adventure" of rock-hounding and Mother Earth herself, we wanted to keep her as natural as possible, and have ourselves dug only by hand. In addition, in order to show her our gratitude for all her crystal abundance, we make yearly offerings of seeded mineral treasures from all over the world, to be dug and shared with our visitors as well. Some of you have also asked about camping...you can call our Forest Service at 870-867-2101 here in Mount Ida to see what campgrounds may be available, and there are also lots of areas where primitive camping is allowed. We can also recommend staying at the Crystal Inn and Restaurant at 870-867-2643 (ask for Liz Liva) and the Royal Oaks in Mount Ida at 870-867-2169 (ask for Jaye). Both places cater to diggers and are nice, clean and reasonable places to stay. Mention RavynHawk and you will receive a nice discount on your room. For those of you who are looking for more private or luxurious accommodations, you might visit our www.mtidachamber.com website for more lodging options (and much more information on the area) from which to choose. You may also feel free to email us at ravenhawk@cebridge.net or call us at 870-867-4072 for more details. Please note: A cancellation fee of $33.00 will apply for each attendee that wishes to cancel their workshop. After Nov. 6th, no refunds will be offered.